Daily swimming lessons for kids! Help your children make faster progress! 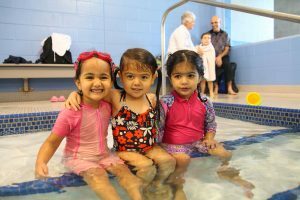 The Making Waves accelerated program consists of daily 30-minute swimming lessons at the same time each weekday for a two-week period. There are convenient Monday through Friday, morning and evening options to suit every schedule. Daily practice leads to faster progress! Only a two week commitment during the busy summer months! See our Calendar for other important dates! For schedule flexibility, we also continue to offer our regular once a week program.